Oysters make a convivial starter in the winter months. They are full of minerals, low in calories and their fresh briny flavor makes it feel like you are swallowing a mouthful of pure sea. Not for the faint of heart, however, as they are consumed live. In France, it is said that oysters should be served only in the months with an ‘R’ — i.e. not in May, June, July or August. 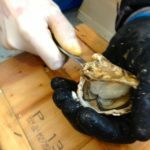 When opening oysters, you can sniff them to ensure they’re safe to eat. If one is bad, it will be immediately apparent and the oyster must be discarded. Another method is to add a drop of lemon juice to an opened oyster just before eating it. If it retracts from the edge, it is fine to eat. You can serve your oysters on individual plates or on one platter for the whole table. How many per person? In French restaurants, portions of six, nine or twelve are usually offered. 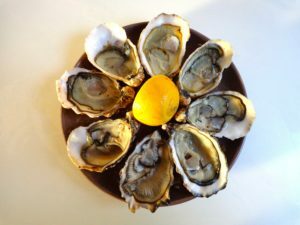 My general rule is six per person — although oyster lovers may want a dozen each, while three per person is fine if there are other starters on the table and a big meal will follow. Use the ingredients below as a guide, and multiply by the number of guests. Be sure to have some chilled white wine on hand — for example, Sancerre, Saint-Véran or a crisp sauvignon. Other notes on serving are included below. 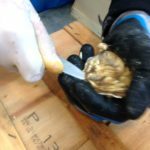 Opening oysters is tricky work — have the fishmonger do it for you if will be serving them within a couple of hours. Otherwise you can buy them a day or two ahead of time and refrigerate until you are ready to open them. Rinse the oysters under running water before opening them to remove any bits of grit or sand. Drain. Hold the oyster in your left hand with the point facing you. Place the knife at the edge of the shell between your middle finger and your ring finger. When ready to serve, cut beneath each oyster to loosen it for easy eating. Place the opened oysters on individual plates or a platter. If you like, you can set the oysters on a bed of crushed ice (see below). Add some lemon halves and, if you like, a small bowl of red wine vinegar with a minced shallot stirred in. If you happen to have small oyster forks, use them. If not, regular forks are fine. Alongside the oysters serve thinly sliced bread, preferably seedless rye, and salted butter. While the French use unsalted butter on most occasions, this is the exception: salted butter is de rigueur. There doesn’t seem to be any historic reason for this tradition, other than the fact that oysters often come from Normandy or Brittany, where beurre demi-sel (salted butter) is more common than in the rest of France. This is surprisingly simple. You will need one or two trays of ice cubes, a sturdy plastic bag and a hammer. Begin by buttering a slice of bread. 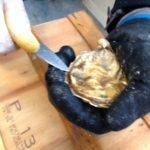 Add a drop or two of lemon juice or vinegar sauce to an oyster (if it wriggles, it is good to eat; if not, you’re taking a chance). Do not overdo it with the lemon or vinegar to avoid drowning the oyster’s taste. Then let the oyster slip into your mouth and enjoy a burst of briny flavor. Follow up with a bite of buttered bread and a sip of well-chilled, crisp white wine.